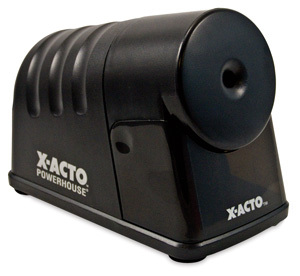 This is a heavy-duty motorized, commercial grade electric pencil sharpener. It features X-Acto precision steel spiral cutters, a Pencil-Saver that prevents over sharpening, and an Auto-Reset mechanism that eliminates motor burnout. Warning — All electrical products have U.S. standard plugs and voltage. Due to damage that can occur when using incompatible plugs, sockets, or converters, Blick does not ship electrical items or accessories outside of North America or to freight forwarders.